Well, Theron Drake is inching his way closer to the age where he's about to take off and never look back! It's nerve-wracking and exciting at the same time! He wants us to walk him everywhere and I know one day he's just going to let go and run wild. We can't wait to see him develop and are anxious to see his little world become bigger. If you're familiar with NVD, then you know we live in a very modest sized Ranch style home, built in the 1960s. It has been a perfect starter home and I adore it. However, we don't have much space. At all. To give little T more room to play and be a typical boy, we decided to use our last bedroom-turned-office as a playroom. 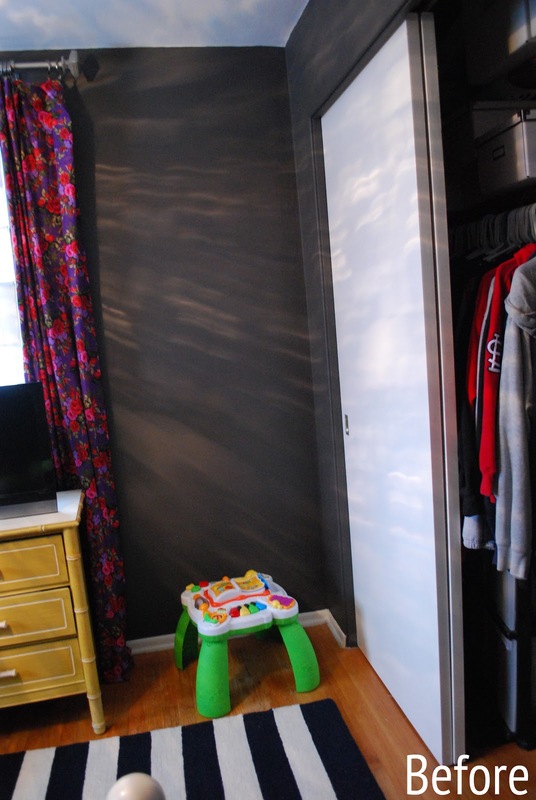 When I decided to turn it into a playroom I had no plans. Nada. That is, until I saw the crazy-awesome-phenomenal playroom belonging to Jen's boys of the super popular blog, iHeart Organizing. Seriously--so fabulous I can't even take it! I'm sure you guys are familiar with her and if somehow you aren't, you gotta check her out. She's my organizational idol. She is as sweet as she is organized, too. Which is an added bonus, for sure. Plus, she's had me on her blog roll and always sends a crowd my way...even when my blogging hiatus was in full effect. Thanks, Jen! 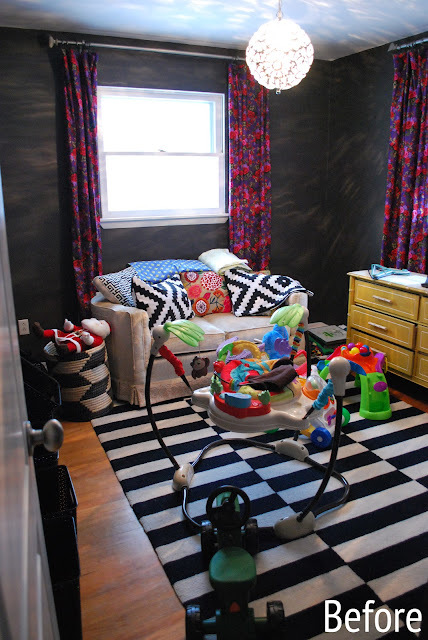 To say I was blown away by her playroom is an understatement! I am using it as the jumping off point for Theron's space and many of her ideas will be incorporated into it. I hope T's space looks even a fraction as good as Jen's boys' room. If you're wondering, the curtains are for sale here, the dresser will be getting a makeover, and the pendant light and sofa are about to go bye-bye as well [I'm hoping to craigslist those bad boys]. I'll keep you posted as this space is transformed. UPDATE: Curtains sold. Thanks for your interest! Loveseat craigslist link and lamps craigslist link. Hi Joi! Do you have the dimensions for the curtains you have for sale? On the sale post it just says "Each panel is approximately " tall and " wide." Thanks! Hi Joi - do you have the dimensions on the curtains for sale? On the listing it says "Each panel is approximately " tall and " wide." Thanks! Jen's playroom has been my fav for a long time now. I can't wait to see your version! 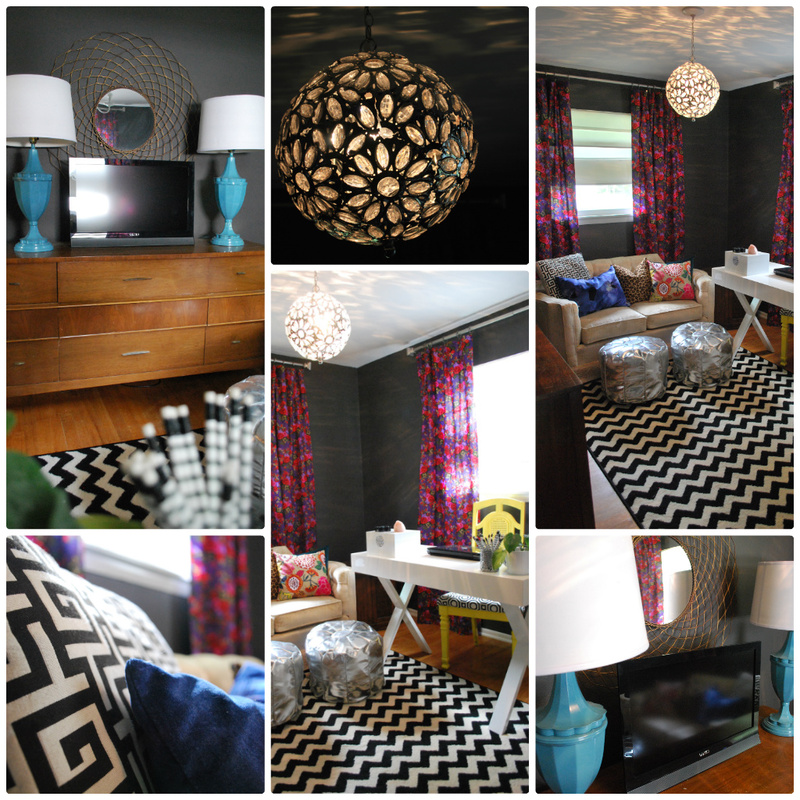 I've missed your room makeovers. I don't have a kid but I'm still excited to see what you have up your sleeve! Dying to see the after! I know it's going to be phenomenal and T is going to looooove playing in it! Are you planning on replacing the sofa with something else? You are probably really going to want some place to sit in there! Hi Joi! I'm interested in your curtain panels. What are the dimensions? Also, could you tell me the name of the fabric? Thanks! @Karlie--Oops! You're right. I meant to measure them and then my husband and I started a different project. I will measure them tonight. They're near 95" tall or so. @Sandy-Definitely! My FIL custom made some bench seating like the IKEA expedits Jen used! @Kendra-Hi there! In my distractedness I forgot to measure them before I listed them--wow. They are near 95" tall. I will definitely do that tonight--so sorry! I forget the name of the fabric and when I click through from my saved pin on pinterest it is no longer available. Ugh, I'm seriously no help! delurking here...have been following your blog and instagram for a while.i am currently using the same inspiration to create a playroom for my 8-month-old. :) i love your style and theron is the cutest!!! can't wait to see the finished room!!! I can't wait to see how it comes together! 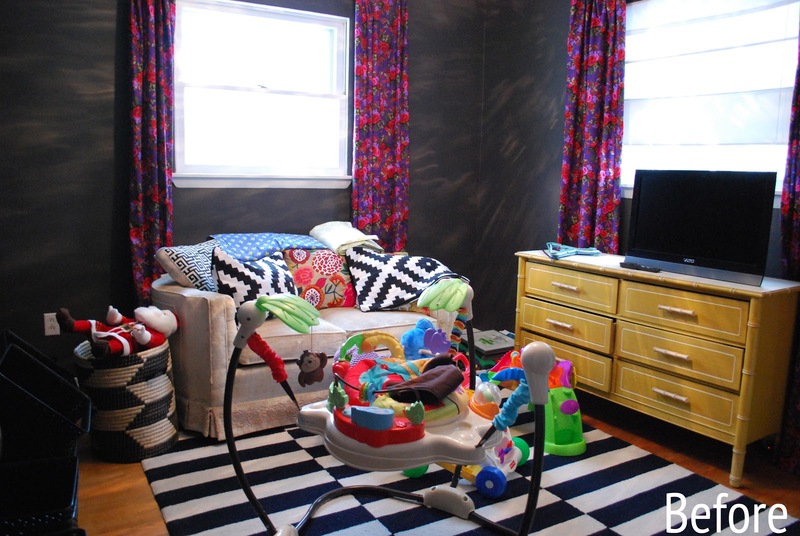 I love that playroom too - I love how it is colorful but doesn't look like a crayola box barfed everywhere. Can't wait to see what you come up with! Love your inspiration pic! No doubts you will pull it off with ease! Can't wait to see! I am so excited to see this come together. I really hate that we don't have a single space to use for a playroom so I really plan to live vicariously through you. I know it will blow my mind with its awesomeness.